Dark Star Gothic Black & Red Cobweb Lace Spiderweb Multi Tier Long Skirt [DS/SK/7364R] - $89.99 : Mystic Crypt, the most unique, hard to find items at ghoulishly great prices! 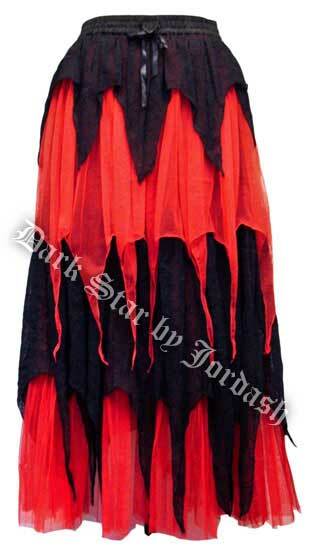 Dark Star Gothic Black & Red Cobweb Lace Spiderweb Multi Tier Long Skirt. This skirt is absolutely gorgeous. Mixed lace and mesh skirt with tiers of spiderweb cobweb lace in witchy hem points. Great addition to any Gothic wardrobe! Elastic waistband with satin ribbon string. Length is 40 inches. Please read measurements carefully!